Through our Community Volunteer Awards, we aim to reward individuals and organisations for the great work you do in our communities. There are a total of 21 awards available under 12 categories. If you would like to nominate an individual, a team of volunteers or an organisation or group for one of these awards, please fill out the online nomination form here. (Alternatively, you can download the nomination form from here). Deadline for nominations is 5pm on Friday 5th April. The impact or difference that voluntary effort has made and is making to our communities within Blackburn with Darwen. Awarded to the volunteer whose enthusiasm and dedication to volunteering has made a real difference to the community within the past year. Anyone can be directly nominated for the Volunteer of the Year Award. However, the awards panel reserve the right to elevate any nomination to the volunteer of the year category if they think the nomination merits receiving the overall award. Awarded to the volunteer who has demonstrated an exemplary long-term commitment to the voluntary, community and faith sector through sharing their expertise, skill set and knowledge. To qualify for the award the individual must have volunteered or worked within the voluntary, community and faith sector for a minimum of 20 years. Awarded to people who go above and beyond for their neighbours and make their communities tick, but don’t expect any reward. Awarded to any individual volunteer or team of volunteers whose enthusiasm and dedication has made an outstanding voluntary contribution to the culture, leisure and sporting life of Blackburn with Darwen. Awarded to an organisation from the voluntary, community and faith sector whose voluntary efforts have made a real difference to the culture, leisure and sporting life of Blackburn with Darwen. Awarded to any individual volunteer or team of volunteers whose enthusiasm and dedication has made an outstanding voluntary contribution to improving the health and well-being of residents of Blackburn with Darwen. Awarded to an organisation from the voluntary, community and faith sector whose voluntary efforts have made a real difference to improving the health and well-being of residents of Blackburn with Darwen. Awarded to any individual volunteer or team of volunteers whose enthusiasm and dedication has made an outstanding voluntary contribution to improving the prosperity, skills or employment prospects of residents of Blackburn with Darwen. Awarded to an organisation from the voluntary, community and faith sector whose voluntary efforts have made a real difference to improving the prosperity, skills or employment prospects of residents of Blackburn with Darwen. Awarded to any individual volunteer or team of volunteers whose enthusiasm and dedication has made an outstanding voluntary contribution to improving the local environment and having a positive impact on people’s lives within Blackburn with Darwen. Awarded to an organisation from the voluntary, community and faith sector whose voluntary efforts have made a real difference to improving the local environment and having a positive impact on people’s lives within Blackburn with Darwen. Awarded to any individual volunteer or team of volunteers whose enthusiasm and dedication has made an outstanding voluntary contribution to bringing together the different communities of Blackburn with Darwen and building a shared understanding between different sections of our community. Awarded to an organisation from the voluntary, community and faith sector whose voluntary efforts have made a real difference to bringing together the different communities of Blackburn with Darwen and building a shared understanding between different sections of our community. This award is awarded in memory of Lindsay Dunn, a volunteer who was passionate about helping the most marginalised people within society. Awarded to any individual volunteer or team of volunteers whose enthusiasm and dedication has made an outstanding voluntary contribution to giving children and young people the best start in life within Blackburn with Darwen. Awarded to an organisation from the voluntary, community and faith sector whose voluntary efforts have made a real difference to giving children and young people the best start in life within Blackburn with Darwen. Awarded to any individual who has made an outstanding voluntary contribution to a community group, small charity, social enterprise that is run entirely by volunteers and has an annual income of under £10,000. Awarded to any small organisation (income less than £10,000) from the voluntary, community and faith sector whose voluntary efforts have made a real difference to the residents and borough of Blackburn with Darwen. Awarded to any individual from across the public, commercial or voluntary, community and faith sectors who has made an outstanding voluntary contribution to getting their organisation more involved in the community encouraging fundraising, volunteering, etc. Awarded to any organisation from across the public, commercial or voluntary, community and faith sectors whose commitment to social responsibility has made a real difference to the residents and borough of Blackburn with Darwen. 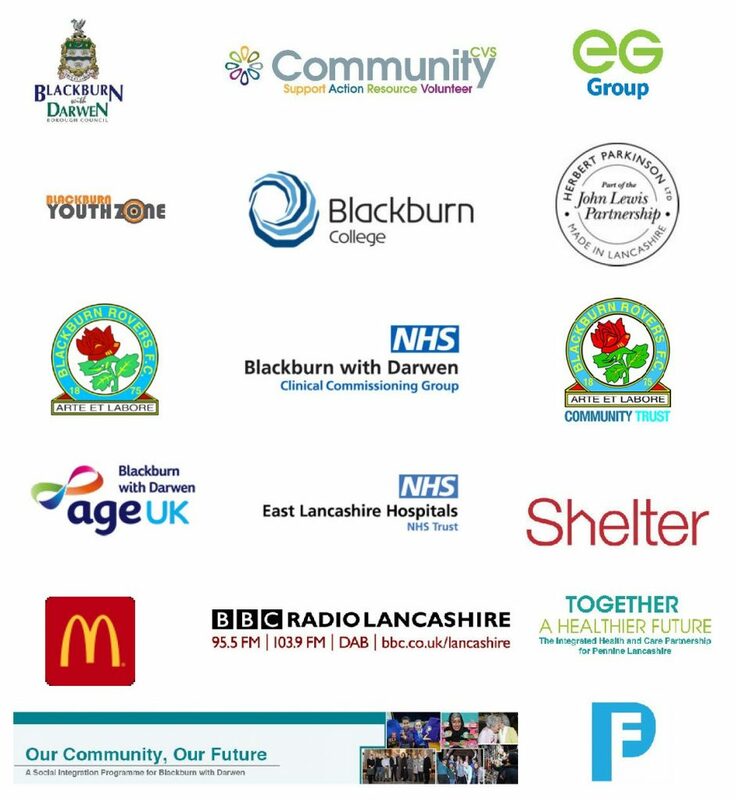 Many thanks to our award sponsors and supporters without whose support we would be unable to put on the Community Volunteer Awards ceremony.